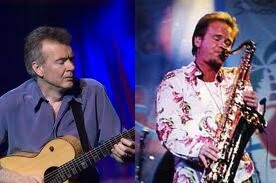 Peter White and Euge Groove are two of Smooth Jazz’s biggest stars. Their music is undeniably recognizable and always finds its way to the top of the charts. So it is a delight when, during the summer concert season, Peter White and Euge Groove team up to impress audiences in person. They will be performing two shows in NYC on July 18th. Before we delve into who these guys are and what makes them spectacular, let us tease you with a performance of Peter White’s “Bueno FunK” in which they team up to show audiences why they are on the top of this genre! Both these musicians had a long history before they became Smooth Jazz legends. Let’s start Peter White. This is man that many of us have heard a long time ago, but never realized it. White first gained fame with his distinctive guitar style as accompanist to Al Stewart. During a 20-year tenure with Stewart, he co-wrote many songs, including Stewart’s 1978 top-ten hit “Time Passages”. In the late 1980s, White accompanied Basia on a series of acclaimed albums. In 1996, Basia was featured on White’s album Caravan of Dreams, with vocals on the single “Just Another Day”. Euge Groove’s sax stylings were also familiar to our ears without us realizing. He had replaced Richard Elliot in the Tower of Power when Elliot decided to pursue a solo career, and he also did session work with various pop acts, most noticeably the Miami girl group Exposé. He has a sax solo on their #1 hit “Seasons Change,” and another on their 1993 hit “I’ll Never Get Over You (Getting Over Me).” Later on Groove went on tour with Queen of Rock and Roll, Tina Turner. The two are touring together again, and hit NYC on July 28th! They will be part of Smooth Jazz New York’s Smooth Cruise summer series with two sailings at 6:30pm and 9:30pm. For more information, visit http://www.smoothjazznewyork.com. Because the Smooth Cruises sell out quickly, it is highly recommended that tickets be purchased early. This entry was posted in Artists, Smooth Jazz News and tagged contemporary jazz, Euge Groove, Peter White, smooth jazz. Bookmark the permalink.